Today, we talk about oatmeal. I know. Oatmeal. It’s either bland and mushy, or oversweetened, artificially flavored and mushy. This, however, is not the oatmeal I intend to talk about. Reserve your rolled oats for oatmeal and raisin cookies, and make steel-cut oats for breakfast. Steel-cut oats (also known as Irish oats) undergo much less processing than rolled oats, and thus offer diners a completely different flavor and texture. Properly prepared steel-cut oats are nutty and chewy (no mush here), and I find them much more satisfying than rolled oats. The bad news: Steel-cut oats can take 30 minutes or longer to cook if you haven’t soaked them. The good news: Duh. Soak them and they’ll be ready in as little as 10 minutes. The prepackaged brands of steel-cut oats always seem to carry a hefty price tag. You’ll be much better off purchasing them in bulk. I buy my supply at Earth Fare for $1.19 a pound. They’re a cinch to make, but you have to plan ahead. Use a ratio of one part oats to two parts water; for two people I usually use 3/4 cup oats and 1.5 cups water. Soak the oats in the water overnight in the pot that you’re going to cook them in. You can get the same results with only three hours of soaking, but not everyone has my luxurious Saturday schedule, which has me getting up at 5 a.m. to feed a geriatric cat and then heading back to bed until 8 a.m. or so. If you’re feeling spiffy, substitute orange juice or cranberry juice for about a quarter cup of the water. The orange juice will add a real citrus bite to the finished oatmeal, and the cranberry juice will complement the dried cranberries that I’m going to talk about in a minute. Put the pot of soaked oats on the stove after you roll out of bed. Turn the burner up to medium-high and let the oats come to a boil, then turn the burner down low enough to keep a slow boil without the oats boiling over. And they WILL boil over if the heat’s too high. Keep the lid on the pot, but lift it every couple of minutes to check your boil and give the oatmeal a quick stir. After about 10 minutes, the oatmeal should be almost thick enough to serve. Lagniappe time. 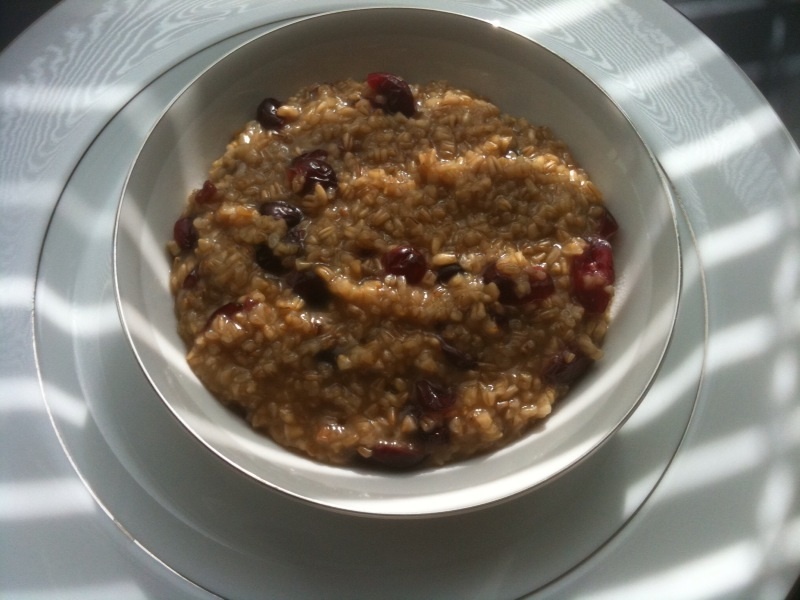 Stir in a couple of tablespoons of brown sugar, and add raisins and/or dried cranberries. Let everything meld together for a couple more minutes and then ladle the oatmeal into your serving bowls. Drop a few crumbled walnuts or pecans on top if you like. Enjoy. And say goodbye to instant mediocrity.